Fort Mifflin on the Delaware proudly announces that the Honorable Edward G. Rendell will be honored with the 2014 Fort Mifflin on the Delaware Distinguished Citizen Award at the Fort’s Fall Gala, “The Spirit of the Fort,” on September 26, 2014. He is being recognized for his enduring public service as an elected official, committed citizen and leader in the philanthropic community, and especially for his support of Fort Mifflin. Initiated in 2011 and presented annually, the Distinguished Citizen Award is symbolized by an engraved reproduction of a Revolutionary War Officer’s dress sword. It is presented to an individual whose character, distinguished service and stature draw wholesome comparison to the qualities that Fort Mifflin on the Delaware strives for, in keeping with its mission. It serves to identify to the public and our supporters the broad national significance of Fort Mifflin as one of our nation’s cherished historical landmarks. Recipients have demonstrated a strong interest in supporting the mission of Fort Mifflin on the Delaware, provided a lifetime of service to the nation, state or municipality or made significant contributions to the nation through their public service. Previous recipients include Nicholas Biddle, Jr. (2011), Samuel Katz (2012) and Vivian Piasecki (2013). Governor Rendell is clearly deserving and joins this list of extraordinary individuals as an example of a life devoted to public service. 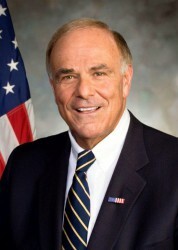 Both as Mayor and Governor Rendell was a leading advocate for the preservation of Fort Mifflin, and he worked closely with the award’s inaugural recipient Nicholas Biddle, Jr. raising money for the restoration of the site in the 1990’s.